Two goals in four minutes helped Japan to a 3-1 victory over Brazil in the SheBelieves Cup on Saturday. Yuka Momiki, 22, scored the opener with a delightful lob in the 44th minute, before Debinha pulled one back for Brazil. Rikako Kobayashi headed home in the 81st minute, before Yui Hasegawa added an impressive third late on in Nashville. England drew 2-2 with USA in Saturday's other game in the tournament. Japan, who are top of the table on goal difference, face England at 22:25 GMT on Tuesday, live on BBC Four, in a winner-takes-all match. 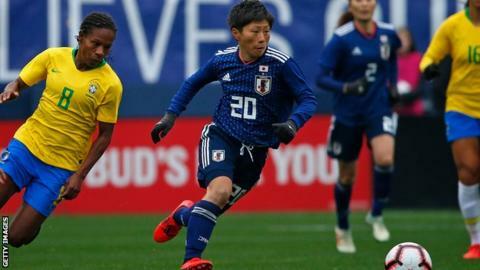 Brazil's over-reliance on Marta, 33 and Formiga, 40, was exposed but they battled well against a Japan side two places above them in the Fifa rankings. Match ends, Brazil 1, Japan 3. Second Half ends, Brazil 1, Japan 3. Attempt saved. Hina Sugita (Japan) left footed shot from outside the box is saved in the bottom left corner. Assisted by Yuka Momiki. Hina Sugita (Japan) wins a free kick in the defensive half. Risako Oga (Japan) wins a free kick in the defensive half. Attempt missed. Jun Endo (Japan) left footed shot from the left side of the box is close, but misses to the left. Assisted by Hina Sugita. Attempt missed. Marta (Brazil) left footed shot from outside the box is just a bit too high following a corner. Corner, Brazil. Conceded by Erina Yamane. Attempt saved. Geyse (Brazil) right footed shot from a difficult angle on the right is saved in the bottom right corner. Attempt saved. Marta (Brazil) left footed shot from the left side of the box is saved in the bottom right corner. Goal! Brazil 1, Japan 3. Yui Hasegawa (Japan) left footed shot from the centre of the box to the bottom right corner. Assisted by Yuka Momiki. Foul by Andressa Alves (Brazil). Goal! Brazil 1, Japan 2. Rikako Kobayashi (Japan) header from the centre of the box to the bottom right corner. Assisted by Yuka Momiki. Attempt blocked. Geyse (Brazil) header from the centre of the box is blocked. Assisted by Marta. Foul by Aya Sameshima (Japan). Attempt missed. Formiga (Brazil) left footed shot from outside the box misses to the left. Assisted by Marta. Attempt missed. Letícia Santos (Brazil) right footed shot from outside the box misses to the left. Attempt saved. Yui Hasegawa (Japan) left footed shot from the left side of the six yard box is saved in the bottom left corner. Assisted by Jun Endo. Corner, Brazil. Conceded by Risako Oga. Offside, Brazil. Letícia Santos tries a through ball, but Marta is caught offside. Attempt missed. Yuka Momiki (Japan) left footed shot from the centre of the box misses to the right. Substitution, Japan. Hina Sugita replaces Rumi Utsugi. Attempt missed. Geyse (Brazil) header from very close range misses to the left. Assisted by Marta with a cross following a corner. Corner, Brazil. Conceded by Moeka Minami. Attempt blocked. Debinha (Brazil) right footed shot from the centre of the box is blocked. Assisted by Bia Zaneratto. Attempt missed. Andressa Alves (Brazil) right footed shot from the centre of the box is close, but misses to the right. Attempt blocked. Geyse (Brazil) left footed shot from the right side of the six yard box is blocked. Attempt blocked. Debinha (Brazil) left footed shot from the centre of the box is blocked. Attempt saved. Geyse (Brazil) right footed shot from the right side of the box is saved in the bottom right corner. Assisted by Bia Zaneratto. Jun Endo (Japan) wins a free kick in the defensive half. Substitution, Japan. Jun Endo replaces Moeno Sakaguchi. Substitution, Japan. Aya Sameshima replaces Saori Ariyoshi. Substitution, Japan. Yui Hasegawa replaces Mayu Ikejiri. Substitution, Japan. Rikako Kobayashi replaces Kumi Yokoyama.